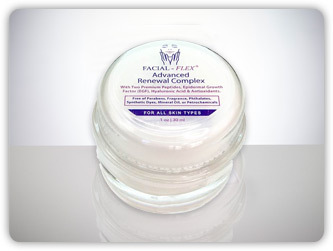 The Facial Flex Advanced Renewal Complex is a world-class epidermal growth factor cream, made with a scientific maximum effective concentration of EGF to regenerate and accelerate the formation of thicker, firmer, skin with increased elasticity. In addition, it offers two powerful peptides and a myriad of nourishing and skin repairing antioxidants suitable for all skin types. Morning and night: Cleanse face thoroughly, pat dry and apply Advanced Renewal Complex on the face, chin, and neck. 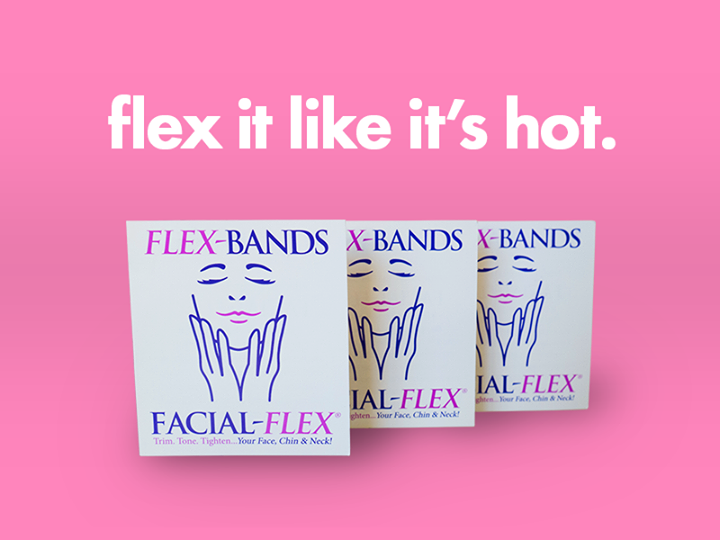 Then begin your Facial-Flex exercise routine. ADVANCED RENEWAL COMPLEX has a powerhouse of ingredients to accelerate your facial fitness program. 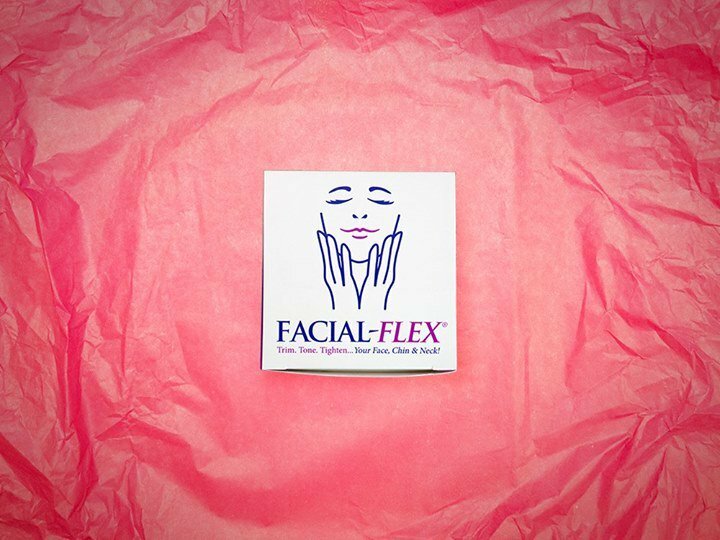 It’s the perfect complement to your Facial-Flex exercise routine that treats both the inside and the outside of your face, chin, and neck. STEP 1: Apply the Advanced Renewal Complex after cleansing and toning to help thicken, smooth and help defying aging skin from the outside. STEP 2: Follow with our Facial-Flex muscle toning device to strengthen and tone the underlying muscles, resulting in a firmer, more toned and lifted face, chin and neck form the inside. EGF Peptide: Amazing scientific discovery, Epidermal Growth Factor (aka sh-Oligopeptide-1 peptide) combines 53 blocks of protein that restore the skin’s density. These proteins penetrate and bind the cells of the dermis (where collagen forms) and epidermis (surface of the skin) and help regenerate and accelerate the formation of thicker, firmer, healthier looking skin with increased elasticity. Two additional Peptides: Age-defying peptide Palmitoyl Pentapeptide-3 stimulates the production of collagen (over 350%) and hyaluronic acid (over 250%) to help prevent, repair and smooth fine lines and wrinkles as well as brighten the skin tone. Copper Tripeptide-1 is a highly effective skin regenerating peptide. Studies have shown that copper peptide promotes collagen and elastin production and also acts as an antioxidant. It promotes production of glycosaminoglycan’s (hyaluronic acid, as an example). Clinical studies have found that copper peptides can help calm broken capillaries and remove damaged collagen and elastin from the skin (scar tissue) because they trigger the skin’s system responsible for those functions. Hyaluronic Acid hydrates the skin, allowing it to appear smoother and more radiant and plump. Clinical studies reveal it speeds wound healing and reduces the appearance of both old and new scars. Hyaluronic Acid is present in every tissue of the body, providing many important functions. It delivers nutrients to cells and can remove toxins from cells and encourages water retention in large concentrations in our tissues including the matrix of the skin (within the fluid-filled space between cells). HA locks moisture into the skin keeping collagen and elastin moist for more youthful-looking skin. Antioxidant Boosters: Astaxanthin is 500 times more powerful than Vitamin E in neutralizing free radicals to help diminish the look of fine lines and wrinkles, promote visible recovery from environmental stresses and promote smoother, more youthful looking skin. Pomegranate Seed Oil is a powerful antioxidant contains punicic acid which can address myriad skin issues. It can produce and prevent the breakdown of collagen, improve skin tone and elasticity and balance the pH of the skin to help reduce blemish and acne breakouts, wrinkles and other signs of aging skin. Excellent for all skin types. Alpha Lipoic Acid is a remarkable anti-oxidant that helps dissolve toxic substances while neutralizing free radicals to protect the skin from damaging elements, smoke and other harmful pollutants we encounter daily. Alpha Lipoic Acid diminishes pore size while gently exfoliates dull, dry, dead layers of skin enabling other topical ingredients to absorb more rapidly and efficiently into the cellular membrane. Lycopene This carotenoid is the antioxidant component of tomato, lycopersicon esculentum. The combination of lycopene and lutein synergistically interact as antioxidants, Lutein Lutein is used by our bodies, but we cannot make it, so we need to obtain it from food or apply it topically. Although its main role seems to be in the health of our vision, in the lens and macula lutea of the eye, lutein is also an excellent antioxidant.